A community of ambitious freelancers, working through videos, short books, podcasts and posts - to help make freelancing more stable. 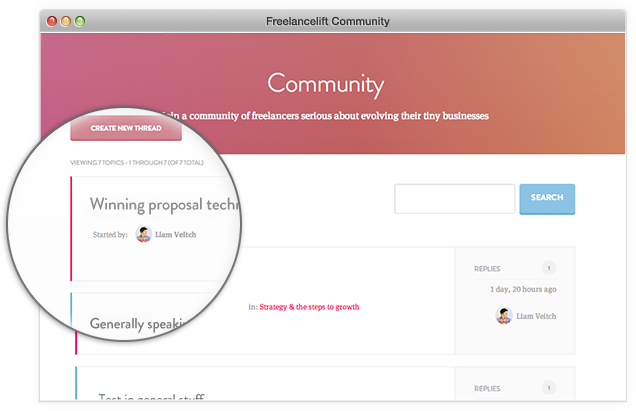 Freelancelift provides the support, training and accountability you'll need to evolve your tiny freelance business into something incredible. You're not exempt from “being in business” just because you're a freelancer, so the free videos, short books, podcasts and people power in the Freelancelift community will help you make progress in your own time, alongside other freelancers at various stages of their development. If you've been freelancing a few years but find yourself questioning why you only earn roughly the same as you did when you had a job then I'm talking to you. You'll be getting insights, recipes and action points on a regular basis, supported by a group of your peers all pulling in the same direction. Grab your free account below. Indispensable meta-knowledge for the #self-employed professionals in concise @freelancelift playbooks. "Nice tips for us freelancers"
Finished going through @freelancelift's ebook on kindle, well worth a read or two, some nice tips for us freelancers. Freelancelift - Some great advice on turning your work in to products. Any freelancers .. tune in ! You can download a growing library of concise free books, each finely tuned to give you the motivation to make every goal stick. You'll get the first 5 for free in your free account. Bringing ideas to life, with a wide array of video sessions breaking down the areas you might be struggling with right now. You'll get the first 6 videos within your free account. Been really enjoying reading the material at Freelancelift. Highly recommend it for creative freelancers!